Ch. 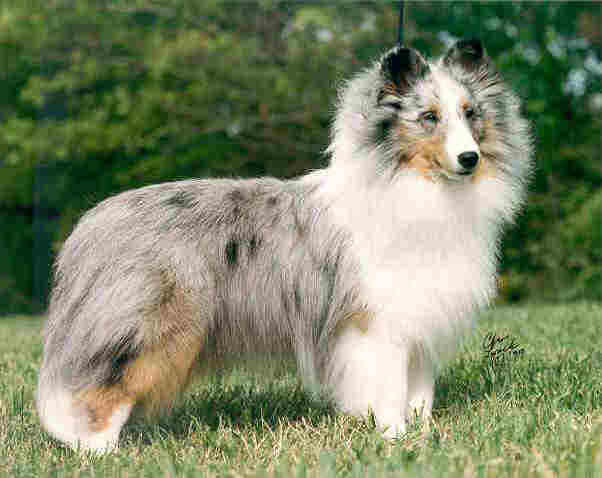 Louimar Bi Request, CD, HC "Dolly"
Dolly is the dam of Ch. Sugar Heart Breaker and Sugar Hill's Bi Design, the two foundation sires of Sugar Hill. She was our spoiled rotten, constant companion for 16 1/2 years. Without her and her legacy, we would not have met all the wonderful people now in our extended family. We were novices when Dolly was born, but at least we had whelped a couple litters, so Leslie's sister asked us to help with the whelping, since she had not done a whelping herself. We were so "green", we didn't dare to write in the records that she was a bi-black, since she had two sables as parents! We wrote "very dark" in the comments until we researched the situation a little more. She had two sable and one other bi-black in her litter, all girls. 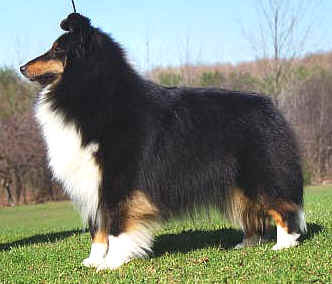 Not only did Dolly finish her Championship and CD, but another sable sister, Ch. 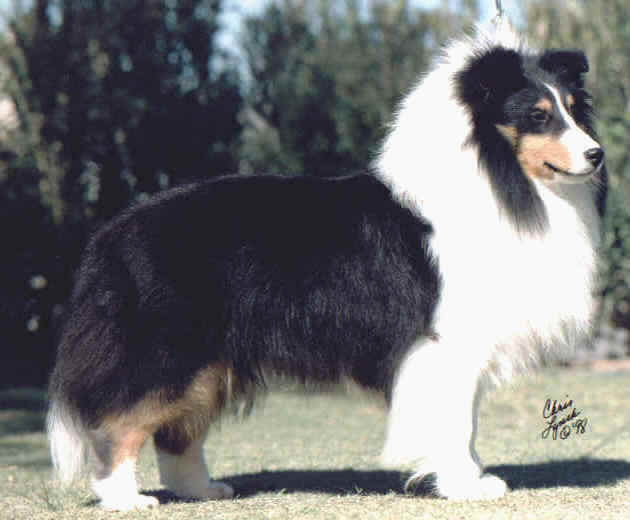 Macdega Seneca Celebrity "Corrie", also finished her Championship. Her bi-black sister "Tootsie" completed her CDX. Nioma Coen finished Dolly to her Championship. Dolly always had a soft spot for Nioma and was always glad to see her at the shows when Dolly was shown in the veteran classes by us. 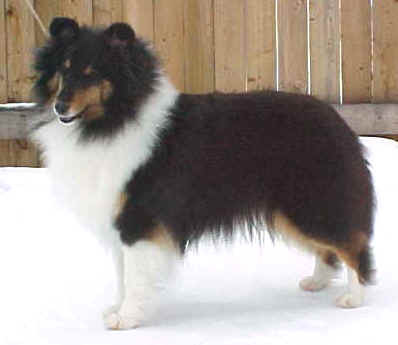 Sugar Hill's Bi Design "Cody"
Cody is the sire of Ch. Sugar Hill Eldorado "Brett" and Am. Can. Ch. Aberdale Sugar Hill Like A Rock "Stone". 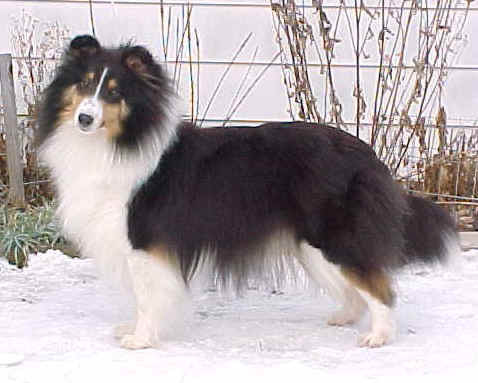 Cody was a finishable dog but just didn't like the show ring. 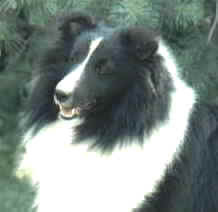 We had not used him much in our breeding program until he was nine years old. We took him with us to the Canadian National Specialty where he caught the eye of many exhibitors. Shortly after returning home, we started receiving calls from the exhibitors saying that they girls that they wanted to have bred to him. One product of this was Am. Can. Ch. Aberdale Sugar Hill Like A Rock "Stone". We also decided to use him more ourselves, which produced Ch. Sugar Hill Eldorado "Brett". Ch. 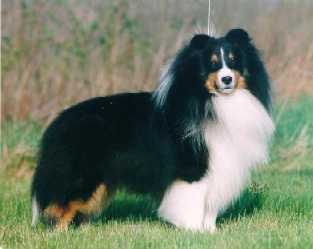 Sugar Hill Heart Breaker "Jasper"
It is with great sadness that we have to tell you that Jasper," Ch Sugar Hill Heart Breaker ROMC", ( Ch Dundee Amos Moses ROM, ROMC ex Ch. Louimar Bi Request CD, HC) went to the Rainbow bridge on Monday June 11, 2007. Jasper would have been 15 on August 27th. Jasper was our first homebred Champion and the foundation of Sugar Hill along with his mother Dolly, "Ch Louimar Bi Request CD, HC" (Ch Macdega Glenhart Grand Prix ROM, ROMC ex Ch Louimar Seneca Serenade CD, HC) and Cody "Sugar Hill Bi Design" (Ch Macdega DeNiro ROM ex Ch Louimar Bi Request CD, HC). He was the start of many new friendships which continues to grow through the years. Jasper was loved by all who new him and was the best companion you could ask for. He loved to run in our back field leading the way for many generations to follow in his footsteps. He will be greatly missed. Can. Ch. Sugar Hill Diamond In The Ruff "Jewel"
Jewel had one four point major then decided that she didn't want to show anymore. so to a new home she went. Sugar Hill Love In Return, ROM "Stella"
Stella is our only ROM to date. She was an excellent mother and producer. No matter who she was bred to, she always produced at least one Champion in the litter. Am./Can. Ch. Kar-Isma Sugar Hill Travel'n Man "Guy"
Ch. Sugar Hill Poetry In Motion "Gracie"
Am. Can. Ch. Aberdale Sugar Hill Like A Rock "Stone"